Dimming: The bulb noticeable dims after a short period of time, most likely due to overheating. When I first started using the bulb I noticed it would dim after about 30 minutes of use. If I tried to correct this the bulb would once again dim after a couple of minutes. No matter how many times I tried to set the bulb back to the lighting configuration I wanted it would always dim after a couple of minutes. I contacted the developers to see if my unit was defective and they mentioned the bulb has a safety feature where the bulb would automatically dim if it gets too hot. I’m working in a climate-controlled office and the bulb isn’t mounted in an enclosed space. It was therefore very unlikely this could be the cause of my problem. Nope, when the bulb started dimming again I checked the bulb temperature and it does indeed get exceptionally hot! After playing around with different lighting configurations and timing how long the bulb takes to dim after a cold start (i.e. bulb left to cool to room temperature), I’m pretty confident overheating was the issue. Feature lock-in: Ilumi currently supports two smartphone apps each of which support different feature sets. The bulb can only pair to one of these apps at a time and so if you want to use a feature on another app you have to manually reset the bulb (i.e. turn the bulb on/off again in a set sequence) and pair it again. This whole process is ridiculous. The developers should have either kept to a single app or allowed the apps to share control over the bulb. Newer app requires a mandatory Log-in: While not a critical flaw this was irksome; a nifty feature of using Bluetooth to connect to your smart bulb is so your not beholden to a network. Why have a mandatory log-in or require the user to log-in at all?! While the first app did have a log-in feature it was not mandatory. After the whole rigmarole getting the C by GE to work, it’s not worth my time trying to get the Ilumi to work. I returned the product after I encountered the dimming problem and couldn’t get it satisfactory resolved. Whether the bulb I had was defective and was overheating more than it should isn’t the point. It’s simply not worth my time to figure out what was wrong and get it fixed. At this point, if I do decide to get another smart bulb, all it has to do is achieve the bar set by your standard light bulb (1) support an on/off switch and (2) maintain a constant light level. If it does that I’ll be happy because apparently that’s really difficult to do. Next Post Dark Escape 4D in Chicago! 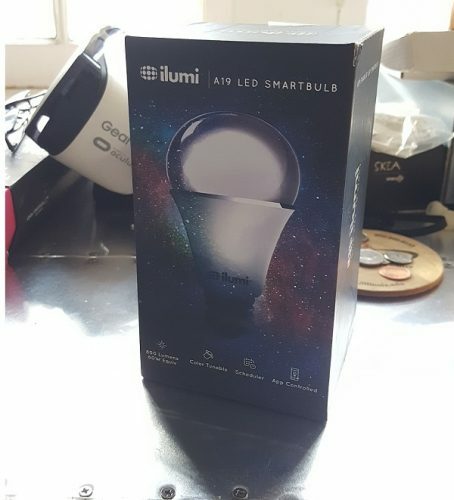 These ilumi bulbs are just junk. For 59.99 at the local busy buy, I expected to receive a lot more out of a lightbulb. Even the app is junk. Looses connection, over half of the features don’t work. For example, when using the music sync feature…It not even SYNCed to the music, it just flashed colors with no perceivable relationship to the music. THEN, I can delete the scene and it keeps flashing when my phone plays music. A hard reset with the light switch is the only way to make it stop. And you can forget about having more than one bulb in a group, it only connects to one at a time so having any form of on demand controllable lighting is out the window. Just to make it clear, these problems were seen on 3 different devices, and 3 different ilumi. So disappointed. I didn’t get much out of the Music Synch feature either. The Simon game was interesting, not exactly the reason I wanted the Ilumi but it was a fun distraction. The Torch feature would have been cool if it worked, but alas it didn’t. Though the Torch feature may have failed as a result of how the Bluetooth radio registers signal strength (i.e. in my experience I’ve only seen the radio capable of discriminating between “not in-range”, “in-range”, “on-top-of-device”, rather than representing a reasonable distance in meters).